A fishy day today. Hahahaha! Really a fishy day. Obviously because its a fish recipe today. 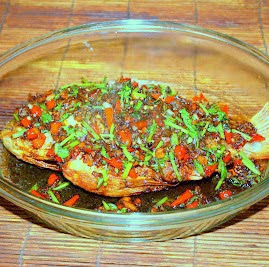 A no-frill, humble and I believe one of the most loved Malaysian fish style. Must be spicy, salty and tangy until we want to feel the explosion of flavours on our mouth, throat and tongue right? Exactly! Then again, it is your food right to the number of birds eye chillies because these chillies, as small as they are, trust me, they can reap your tongue apart with their extreme spiciness. Other than that, all should be well and good for the rest of the ingredients. Fish deep fried, and the spicy, tangy and salty sauce. atop. Happy cooking love. Lather fish with turmeric powder and salt. Leave about 2 tablespoons of oil in the wok. Add chili padi and the rest of the ingredients. Pour ¼ cup of water. Off the heat and stir in coriander leaves. There's a mistake in the ingredient, it should be turmeric powder and not saffron powder. My apologies for that. This is such a lovely way of fish fry!! Delicious!! This looks delicious...Loved that spicy sauce over the fried fish,yummy!